How Should We View the Results of the Multicenter Selective Lymphadenectomy Trial-1 (MSLT-1)? 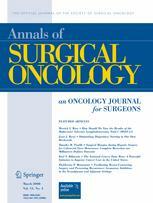 Is There a Place for Esogastric Cancer Surgery in Cirrhotic Patients? Comparison Between the Minimum Margin Defined on Preoperative Imaging and the Final Surgical Margin After Hepatectomy for Cancer: How to Manage It?